Even if they're just making a casual connection, somehow I thought we'd gone beyond this kind of idiotic stereotyping/prejudice...obviously not. HA! Of course the movies made him do it. I'd like to borrow some of those though! V the complete series! That's awesome. Oh what's The Real Cannibal Holocaust? Exacerbate his seriously messed up 'programming' Yes. Once he chose to go that way, I'm sure the 'ideas' the movies gave him guided his plotting. 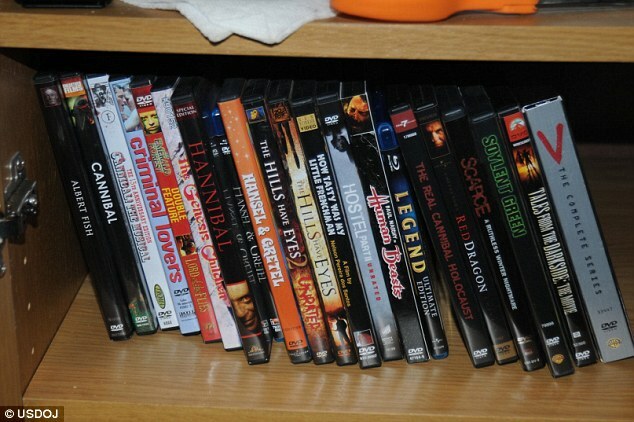 No one should be surprised a cannibal has a collection of cannibalism related movies. But where is DELICATESSEN, or A BOY AND HIS DOG? The guy obviously didn't have particularly good taste. I don't know. They may have a point. For instance, I know after watching Battlfield Earth, I wanted to destroy mankind. No need to go that far. Hollywood would do nicely as a target. A mind gone very wrong that needs an excuse or a reason or an alibi......so sad. Actually, it almost put me on the floor from laughing. Society- Blame the Video Games, Blame the Movies, Blame the Music, But Whatever you do, Don't Blame the Psychological aspect. The FBI profilers (at least I remember it being them) did a study on this, and what they figured out is that people have much, much more leisure time than they used to -- instead of working 12-hours days every day of the week, they can now sit back and fantasize for hours every day. And a few of those people are going to have really messed-up fantasies. And a few of THOSE are going to go out and act on those ideas. The thing they didn't mention in the study is that people are a lot more isolated and don't need each other for survival the way they used to. And they['re so mobile -- the world is full of strangers. Notice how serial killers almost never kill people they know? It's easier to treat a stranger that way. And think of Pee Wee Gaskins, who killed many total strangers and a few people in his own family and neighborhood. He called the latter victims his "real murders." The others were just meaningless entertainment for him. I've watched certain movies in the past that have directly influenced me to call up an ex lady friend just to see if I could still bang her. I'm not blaming nor praising the movie, I'm just saying there may be a correlation there. I don't think it's the movie's fault for my ego trips any more than it's my fault for actively seeking out a particular movie for whatever. The action I take because of having watched the film is literally of my own doing, but the affect of my action is literally of the filmmaker's mind. So to say a movie isn't part of the problem just because you're not effected in the same way as a person who is, isn't a very good argument. Millions of people can watch the same movie without any problem what so ever, but what difference does that make to someone who does have problems afterwards? I do however have a problem with censorship. I think if the statistics aren't there to quantify censorship, then it should be case closed. An ex: if 7 out of 10 people rob a bank after eating [__] then we should probably take a closer look at [__], whereas if 1 out of a 100, 000 people go out and kill a random stranger after watching [__] then we should just leave it be. I've watched certain movies in the past that have directly influenced me to call up an ex lady friend just to see if I could still bang her. I'm curious as to what movie that was. The She Beast?